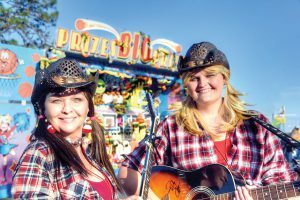 Kathy DeVane, performing as Sadie Mae, and Kristin Jenkins, performing as Sara Jane, strolled among the fairgoers playing country music. The pair is from Polk County. Fair-goers could watch acts ranging from the Axe Women Loggers of Maine, to Robinson’s Racing Pigs to a Barnyard Review to Lizzy the Dream Girl’s Hypnosis Show. There were plenty of livestock shows, a celebrity milk-off and hay bale creations on display. 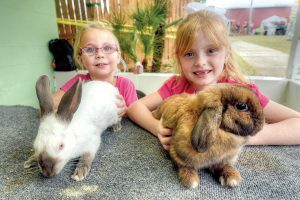 Five-year-old Maddie Samanka, of Blanton, and 7-year-old Lily Briscoe, of San Antonio, show off their rabbits. People could amuse themselves by going on rides that spun them high in the air, or just gave them a great view of the fairgrounds. They also could step right up to try to win prizes at various games on the midway. 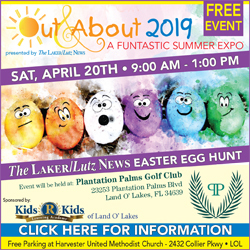 There were musical acts, including “Matt’s Family Jam,” “The Triumphant Quartet and The Rob Mills Family Gospel Music,” and entertainers who strolled through the fairgrounds. And, of course, corn dogs, boiled peanuts, fresh lemonade and other fair foods.